Increasing incidences of various types of cancers all over the globe has caused a rise in the need for cancer biomarkers, thereby providing a healthy impetus to the associated market. Such an increase in this deadly ailment is also due a surge in habits such as smoking and drinking, as well as exposure to high amounts of particulate matter and pollution. With widespread advancements expected to occur in terms of new and efficient equipment used to monitor cancer cases, the global cancer biomarker market too is prophesized to witness an unprecedented progress. According expert analysts, the global cancer biomarkers market is expected to exhibit a splendid CAGR of 11.8% during the forecast period from 2017 to 2025. In this timeframe, the market is anticipated to gain revenue worth US$27.63 bn by the end of 2025, which is a decent rise from the earlier revenue worth of US$10.25 bn in 2016. CA tests, HER2 tests, BRCA tests, ALK tests, CEA tests, EGFR mutation tests, KRAS mutation tests, and others are segments. Under disease indication, breast cancer, lung cancer, colorectal cancer, melanoma, blood cancer, prostate cancer, ovarian cancer, stomach cancer, liver cancer, and others, comprise major segments in eh global cancer biomarkers market. With respect to the test type, the CTC tests segment accounted for maximum share in the global cancer markers market in 2016. This segment is furthermore expected to continue its leading stance during the forecast period from 2017 to 2025. The main factors responsible for ushering positive growth in the market involve an increase in prevalence of various types of tumors and rising incidences of cancers related to the vital organs. CTC tests also are possess fast processing abilities and provide quality results than other tests, thus being highly preferred by healthcare specialists. From the perspective of disease indication, the lung cancer segment held topmost market shares in the global cancer biomarkers market in 2016. This segment is further expected to proliferate during the forecast period as a result of several factors. Increasing prevalence of lung cancer in most regions, rising instances of cigarette smoking among the global population, and increasing geriatric population are some of the reasons that are responsible for causing lung cancer on a large scale basis. In addition, several technological advancements are occurring with regards to decreasing side-effects associated with biomarkers tests and early detection of the illness. These advancement too are driving an extensive demand for lung cancer diagnosis from a global perspective. 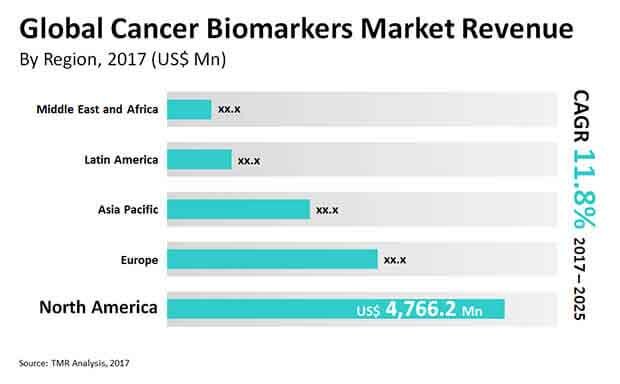 From a geographical perspective, the global cancer biomarker market is spread across Asia Pacific, Europe, the Middle East and Africa, Latin America, and North America. Of these, North America remains dominant since 2016, owing to several reasons. Some of the key factors include high prevalence of different cancer types, increasing healthcare expenditure leading to a rise in demand for better diagnostic tests and health care services, and widespread technological advancements in the field of cancer biomarkers occurring in the region. However, the market in Asia Pacific is projected to register a significant growth rate by 2025 due to availability of a large patient pool and increasing awareness about deadly healthcare concerns such as cancer. In addition, high percentage of geriatric population, and increasing disposable incomes are expected to propel the market in this region too. Abbott Laboratories, Thermo Fisher Scientific Inc., F. Hoffmann-La Roche Ltd, Illumina, Inc., Agilent Technologies, QIAGEN, Merck & Co., Inc., Hologic, Inc., Novartis AG, bioMérieux SA, and Genomic Health, Inc., are key players operating in the global cancer biomarkers market.